Flora Friday in Oz: Hassans Lookout - Lithgow. 11th October 2013. Hassans Lookout - Lithgow. 11th October 2013. The main reason for today's destination was because of a sign at the lookout which states that there are some 50 species of orchid to found here. I think that I will have to make several more trips to find the other 47. Temperatures, some 9 degrees cooler than home, made this a pleasant place to be on this hot spring day. Foot note: I believe this area has been spared in the recent bushfires around Lithgow (23/10/2013). One of the Native Pea Flowers (family Fabaceae) but not sure which one. Tufted Blue Lily, Tufted Lily. Rupicola apiculata (no common name). Leucochrysum albicans - Hoary Sunray. Daviesia latifolia - Broad-leaf Bitter-pea, Hop Bitter-pea. Rice Flower, White Dogwood, Pill Flower, Sago Bush, Ball Everlasting. Slender Sun Orchid, as above. Stypandra glauca - Nodding Blue Lily. Sticky Everlasting, Yellow Paper Daisy, Shiny Everlasting. Stegostyla gracilis - Musky Caladenia. Stegostyla gracilis - Musky Caladenia, as above. Conospermum ellipticum - Coneseeds, Heath Smokebush. Philotheca obovalis - Silky Wax-flower, Fairy Wax-flower. Patersonia sericea - Native Iris, Silky Purple Flag. This was growing out of the rock-face. Leptospermum sp. (can anyone tell me if this is L.blakelyi ) not sure. Thelymitra ixioides - Spotted Sun Orchid, Blue Sun Orchid. Hibbertia empetrifolia - Trailing Guinea Flower. (not 100% sure). Boronia microphylla - Small Leaf Boronia. Hassans Walls Lookout is the highest in the Blue Mountains at approx. 1,100 metres (3600ft). When is a seat not a seat. The plants were photographed on the points left and right, and behind and under this point. Hassans Walls, from the 'Second Lookout'. Beetle could be a Procrisina sp. (Leaf Beetle). The oil glands in the Tea Tree leaf can be easily see back lit by the sun. Stigmodera macularia, one of the Jewel Beetles. 2 species of Leptomyrmex ants. Ants looking for a meal on a everlasting daisy. Not sure if it's a wasp or a bee. A fly also drops in. 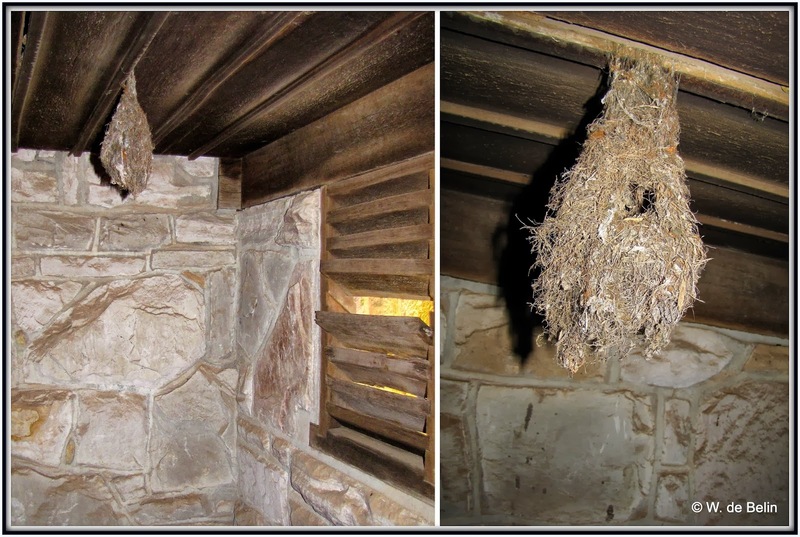 Nest of a Rock Warbler, hanging from the ceiling in the old toilet block. One of the Bee Flies. Could have been tonight's dinner. I'm sure I had 2 arms when I left home. At the closed 'Second Lookout'. Mitchell Park National Park. 18th October 2013.